Enjoy Age of Empires 2 in a new way and relive the Sengoku (戦国) war on your favourite RTS. Built on the upcoming Userpatch 1.5, there has never been a better time to play. New features in game will allow better multiplayer, more triggers and conditions, higher elevation levels, shore-less terrain placement and more. Twelve playable clans (for now): Oda, Takeda, Uesugi, Chosokabe, Date, Hojo, Mori, Shimazu, Toyotomi, Otomo, Asakura and Tokugawa. A total re-skin of 99% of the trainable units, from warriors to monks and villagers, all with brand new appearances. A new, unique and detailed Japanese building set replacing the generic Asian buildings. Extra buildings are also included in the editor, allowing players to recreate a realistic Japanese town. Completely re-designed terrains to match the landscapes of Japan, including trees, cliffs, rocks and more! New heroes, editor units and objects, eyecandies for scenario designers to create a living atmosphere. View the project page on AOK Heaven or join our Discord for discussion, playtesting and early access releases. Brought to you by Achesun, Sebastien and R_V_A. The Chōsokabe clan hail from Tosa Province, Shikoku. Chōsokabe Kanetsugu was the clan leader in the early Sengoku period, but he was killed, forcing his son, Chōsokabe Kunichika, to be raised by the Ichijō clan. Afterwards, Chōsokabe Kunichika, managed to get revenge and with the help of the Ichijō clan, destroyed their rivals, the Motoyama clan. Kunichika's son, Chōsokabe Motochika, succeeded the clan and eventually took over the whole of Shikoku by 1583. However, the reign was short-lived. In 1585, Toyotomi Hideyoshi invaded Shikoku with over 100,000 men, after Chōsokabe initially refused a plea deal (which meant they gave up every province except Tosa). 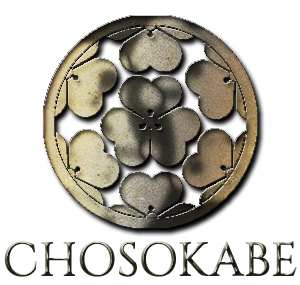 Chōsokabe were defeated through battle, but ultimately were allowed to keep their home province in Tosa anyway. They went on to serve the Toyotomi clan in all of his major battles, including the invasion of Kyūshū (where Motochika's eldest son, Chōsokabe Nobuchika, died), the battle of Odawara, the invasion of Korea and the battle of Sekigahara. Motochika peacefully died in his mansion, and one his sons, Morichika, took over the clan. Chōsokabe Morichika supported Toyotomi during the Siege of Osaka. He was was executed (along with all his sons) by Tokugawa and the clan was destroyed. It is said that one of the (many) reasons why Akechi Mitsuhide may have betrayed Oda Nobunaga, is because Oda was becoming more and more wary of the Chōsokabe. Akechi Mitsuhide and Chōsokabe Motochika were very good friends, and often sent letters to each other. Originally, Nobunaga gave Chōsokabe Motochika his blessing by becoming god father to his eldest son, but eventually, Nobunaga was already planning an invasion of Shikoku. Apparantly Chōsokabe Motochika was ready to submit to Nobunaga, but perhaps Akechi Mitsuhide, knowing full well Nobunaga's character, knew that this was a fruitless idea. The Ichiryō gusoku were a group part time farmer/warriors. During times of peace they would tend to the lands, but when needed, were quickly called to battle. They often owned their own weapons and armour but unfortunately, were not very rich and were ill equipped to be fighting against larger forces of more well armoured and equipped Samurai. This is somewhat reflected in this tech, by allowing their lower ranked and armored Ashigaru to be trained more quickly. Having everybody armed with weapons and armor, meant no shortage of skilled warriors. Here, The Daikyu Samurai, is no exception to this rule (or maybe we just liked the idea hehe). 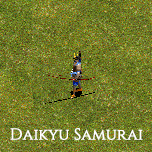 The Daikyū was a type of longer bow, which took more time to fire, but is more powerful and has higher range. These are also fully armored Samurai, so stand up to melee units, and other ranged units, a lot more than other Yumi units. Farmers work and move 15% faster. They are a trash infantry clan with good archers. Quick to train Ashigaru through their Ichiryō gusoku, but with weaker cavalry and siege. They also have a strong navy, having access to all available ships in game, except for the Carrick and Mekurabune. Their strongest point is in their farming, reflected from their strong farming background. A group of Daikyu Samurai hold off an uphill assault of Yari Ashigaru. All information here is subject to change. This is an alpha preview and may not represent the final game version, due to game re-balancing, new ideas or otherwise. Here, we outline one of the playable clans in Sengoku, and discuss their history, clan bonuses and unique units. Today's clan is the Asakura Clan. Introducing one of the most unique random maps we have created, the JAPARI PARK. Hey, it's april 2019 already :< You said this mod will be released in last year :< Can we get a beta version to play ? Love this mod, amazing!! is this project dead ? no, we're just busy doing stuff. discord is the best way to track progress. I'll admit I've been a bit lazy/tired/busy to update modDB every so often. Holy crap man , this mod is amazing probably the best mod idea ever for AOE II, keep going dude this will rock !!! Are you planning on giving the Otomo some Portugese soldiers? Such as the Portuguese Terço? No. The Terço units never served in Japan. In fact, the Portugese didn't field any soldiers during the Sengoku period in support of anyone. The same unit in Shogun:TW was included by an assumption and is not historically accurate. The only instance of Portugese military involvement, according to some sources, is the Siege of Moji; where Portugese Carricks bombarded a Mori castle before an Otomo assault. That being said, Otomo will have unique access to a Carrick ship, but they're limited to 1-3 of them. Other than that, the Nanban post will provide unique techs, trading options and other benefits that represent more accurately Portugese involvement during the period (which consisted mostly of direct trade, introduction of Christinity and being middle men to Chinese-Japanese trade also. ).